Heat the oven to 450℉. Wash potatoes and prick with a fork. Wrap in aluminum foil, and bake for an hour to an hour and a half, until potatoes are tender throughout. Meanwhile, heat the oil in a large skillet over medium-high heat. Add the chicken pieces and saute for 10 minutes or until chicken is no longer pink. Add the diced onion and saute another 2 minutes. Add the chopped broccoli and saute another minute. Season with salt and pepper as desired. Whisk the flour into the milk. Pour the milk and flour mixture into the skillet with the chicken and broccoli, stirring constantly. Add the shredded cheddar and keep stirring until cheese is melted into a thick sauce. Make a slice in the top side of the baked potatoes, squeezing in at the sides to open. 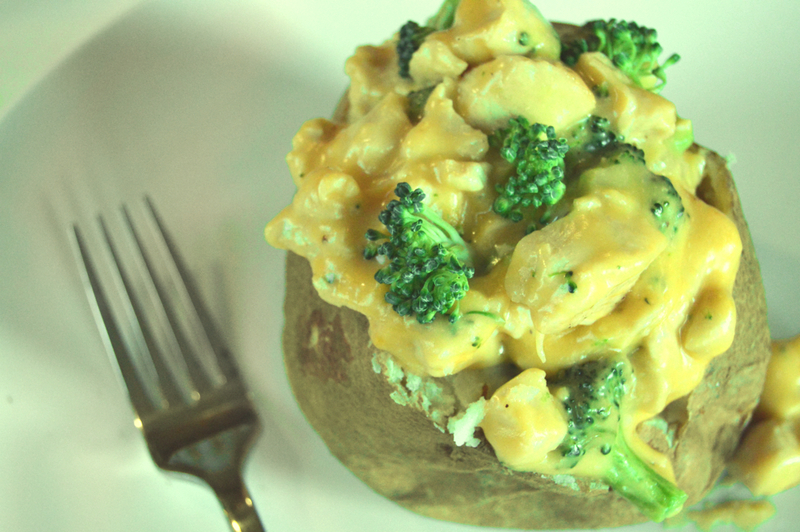 Top with cheesy chicken and broccoli mixture.